WOW isn’t a word used in classical music reviewing but this Lyrita re-issue deserves it and I use it because I’m of an age to have the original 1968 vinyls, so there! After playing the ‘brat’ card I must start with something unusual from my pen when I say that the digital remastering by Simon Gibson pulls even more sonic range and detail from the master tapes than are on the LPs. My caveat - as usual - is that one must use top quality DACs and cabling from the digital source but I played the vinyls on a Technics ex-BBC with Shure as well as a GL-75 and Ortofon through a Quad series 4 to ancient ESL 57s. The same middle and back end was used with this CD with a modest Cambridge Discmagic transport and optical cables to Midiman, Meridian and Beresford DACs before feeding the Quad system. Re-test used SR Tech speakers for better bass but the result was the same. Remarkable because everything was more open and this is rare so let us praise an engineer for a change but do accord him the courtesy of using appropriate gear. Boult was always happier with the 2nd symphony than with the 1st. Some have suggested that its ‘imperialism’ was the reason but I disagree that it’s imperialist, merely of its age. Boult’s analytical nature perhaps found too little to do in it. My evidence lies in his EMI recording of 1976 (CDM 7 6401 2) and the fact that he seldom conducted it live, preferring to give way to his friend ‘Johnny’ (Barbirolli) who was of the right temperament for that side of Elgar. Boult said that the best ‘Gerontius’ was Barbirolli’s because he captured occasions and that wasn’t Boult’s way in his official career. I shall refer to his post-retirement period below regarding Elgar’s 2nd. 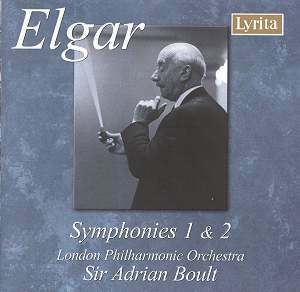 Unlike his EMI Elgar 1st of 1976 Boult had the freedom to conduct the LPO for Lyrita on his own terms but with some familiar Decca engineers of his earlier days. He explored the sheer beauty of Elgar’s struggle to get to a symphony. It is perhaps less ‘in yer face’ than Davis live with the LSO or the essential EMI 1962 7 64511 2 NPO with Barbirolli and his glorious 1970 King’s Lynn Festival recording on BBC Legends with live noises and the resonance of the St Nicholas Chapel but with the Hallé on top form. For example, in the opening theme, then in its repetitions in the large work, Boult refuses to bash the timps as Barbirolli always did yet Boult uses the timps elsewhere in the symphony with the luxury of ideal recording conditions. It reminds me a lot of the Anthony Collins Sibelius 6th by Decca (reissued and reviewed on MWI), as if to avoid the obvious. It is, I think, a weakness when compared with Barbirolli’s more direct approach in his EMI and way back to a Pye LP with the Hallé when I was in my teens. But it was so damned exciting! Thus, for Elgar, Boult and recorded music fans this most welcome reissue is a marvel and a necessity. That said, it lacks the emotional thrust of Barbirolli in all available versions. The BBC Legends reissue of Barbirolli’s 1970 live recording of No.1 [BBCL 4106-2] is probably the nearest to perfection. He of course had the benefit of expert BBC engineers of those analogue times all committed to truth for about £10. They delivered a straight ADD transfer of sheer glory and quite amazing dynamics. In the Symphony No 2 in E flat I admit to being biased because I have an archive tape of Sir Adrian’s last performance of it at a Prom. This was at a time when he was supposedly retired. The sheer glory of that performance is like a ‘mind altering substance’ as the supreme conductor said goodbye to his favourite Elgar. The Lyrita of 1968 might seem a bit restrained to some listeners but I recommend several listenings - avoid headphones because this music needs space - then what Boult was doing is clear and, in many ways, definitive. Boult doesn’t conceal the Brahms and Bruckner influences - or cribs as RVW would say - any more than in the 1st Symphony but he sets out the stall of a great English composer from "the land without music" into the heart of the Continent. Forgotten imperial Britain in a cultural sense had to think again with the ‘Enigma’, ‘Gerontius’ and the Symphony No. 2. The First in A flat still had a bit of a programme element in it. It had started as a ‘symphony’ in tribute to General Gordon and astute Elgarians can see the Sellotape – even though it’s a great symphony. Michael Kennedy’s succinct sleeve-notes mention the Gordon matter but I would have liked a better explanation for new listeners who do not know the background; not all buyers are over 50. No. 2 was written purely as a symphony with no programme. Michael Kennedy’s notes describe how disappointed Elgar was by the reception at the premiere in 1911 with the composer conducting. He mentions that Boult revealed the work’s "true qualities" in 1920. We have to accept that Sir Edward wasn’t much of a conductor but Boult was a supremely great one. The aforementioned last Boult Elgar 2nd live is a true occasion. Presumably it is in the British Library Sound Archive but I have it anyway. The odd bits of restraint in this Lyrita and what some might call being too analytical should be set in that context. Boult was never less than exact but he could be mischievous and even moody like any great musician. Thus I shift to the Colin Davis live recordings of both symphonies for LSO Live - more expensive than Lyrita - and praise the issues. There is much excitement, especially in No.2. I like the darker side of the symphony which Sir Colin pulls off to great effect – but so does Boult in the live Prom version as well as in the Lyrita if one listens hard, especially in the slow movement. What Boult knew personally and Davis understands is how reactive Elgar was to events. The dark moments surely reflect the composer’s apprehension of at least the end of an era if not a hideous war. Elgar was never so self-absorbed as to be elevated from being a man, English but also a Catholic; so a bit unusual back then. The Lyrita reissue is technically perfect and must be essential to Elgar students, especially in the fine ADD format. It displays the best of analogue accuracy which is rare. Although Boult had freedom in the Symphony No.1 to explore and analyse the work it doesn’t quite hit the heart. Boult’s EMI 1976 version is more emotional without conceding integrity but, for my money, Barbirolli is better in his 1962 version and supreme in the BBC live 1970 version at King’s Lynn. Colin Davis is impressive but I give the top recommendation to the BBC Barbirolli. Boult’s Lyrita remains essential for its analytical style. It’s a must have for Elgarians of all ages. In Symphony No.2 Boult scores over EMI, Lyrita and his last Prom performance of a symphony dear to his heart. Barbirolli and even Davis show some vagueness in the links between light and shadow in this remarkable work. Boult gets it right in every case. MWI readers will appreciate how important the Elgar symphonies were for English music after a barren period during imperial/material success. This remarkable Lyrita reissue sets a standard to be compared with the other recordings mentioned above, others not mentioned and in times to come. Rarely, rarely comes an opportunity like this.